With the Karnataka Assembly elections hovering around the corner early next year, Prime Minister Narendra Modi’s vision of a Congress-mukt Bharat does not seem to be too far away. In fact, if BJP’s recent historic win in UP is any indication of Congress going into a coma, there are strong reasons to believe that a repeat performance by the former in Karnataka, would sound the death knell of the country’s oldest political party. The failure of the Congress to evolve with the changing political scenario in the country in keeping with the aspirations of the people, its outdated and lacklustre leadership and a clueless cadre have all had the combined effect of sending the party into a tizzy. Besides the failing and faltering on the part of the Congress, the buoyancy of its main adversary, namely the BJP, riding the crest of a winning spree all over the Hindi heartland and the inroads it has successfully made in the northeastern parts of the country, which had thus far remained a Congress stronghold, coupled with the skyrocketing of the popularity and the towering image of Prime Minister Narendra Modi as the architect of a modern India through an ongoing series of reformation measures, has made the wilting of the Congress under pressure, inevitable and unavoidable. So much depends on the ability of the BJP to do a UP in Karnataka. Besides sending Congress into political oblivion, a pro-BJP outcome would mark the single-most transformation witnessed in post-Independence India, namely, an absolute rejection of pseudo-secularism as a primary political issue, let alone poll plank, by the people. No more elbowing out of the economic development of the nation and social progress of the people by appeasement of minorities and the bogey of communalism. The victory of the BJP would truly mark the purging of the imaginary and falsely projected ghosts of communalism of the past and the coming of age of developmental politics in the country. To this end, the BJP should continue to project its policy of the all inclusive development of the nation with the participation of all sections of our society, as its main poll plank. The party must convince the voters that their long wait for a smooth and uninterrupted economic development, the benefits of which would percolate down to the last man in the country, is over and a viable alternative to the corrupt Congress ideology is at hand. It must also allay the baseless and unfounded fears of persecution instilled in the psyche of the minorities and the marginalized sections of society during all these years since Independence by the Opposition. The electorate must be weaned away at all costs from the bogey of Communalism and pseudo secularism. This would be the single-most prominently striking takeaway from the elections. The BJP should recount its successful demonetization program and the blitzkrieg conducted by the governmental agencies to unearth black money and bring the economic offenders to account. How the Prime Minister’s pro-poor economic measures helped shore up his stock among the poor and the middle-class which helped the government in successfully implementing the demonetization is the kind of stuff that should prominently figure in the party’s campaign. The electorate should be assured as to how the high and mighty have fallen from their high horses, being unable to escape the clutches of law for the economic offences flagrantly committed by them with impunity in connivance with the corrupt elements in the government and establishment in the past. That the rule of law reigns supreme in the country under the BJP rule is what would win over to it the electorate in the state disenchanted with the evils of corruption and nepotism prevailing in Karnataka. An alternative government capable of providing clean governance, responsible for its actions and answerable to the people is what the people of the state are yearning for in place of the current Congress dispensation under an opaque state leadership. How the BJP would provide a viable and effective alternative, on the lines of the popular government at the Centre is a key factor that would determine its success. It must also be noted that although the central government funds a long list of Centrally Sponsored Schemes (where a part of the budget is contributed by states) and Central Sector Schemes (wholly funded by the centre and related mainly with scholarships to backwards), many such programmes fail to reach the intended beneficiaries owing to their lack of knowledge of such schemes and the lackluster approach of local administration in implementing these social sector initiatives with dedication and effectiveness. For BJP to let people of southern states realise the works done by present NDA government, promoting these centrally funded schemes, both for ultimate welfare of the needy and for winning the electorate’s support, is warranted. Of equal importance are NaMo-led government’s social welfare measures that are aimed at empowerment of women (PM Ujjwala Yojana), prevention of foeticide and infanticide, encouragement for educating the girl child (Beti Bachao, Beti Padhao Scheme), etc. How the effective implementation of such schemes and measures helps identify the most vulnerable link in the chain of women development, namely women in rural areas, and strengthen them for their individual and collective development, would be of special interest to the female segment of the electorate. All these will contribute towards making them proud and equal partners in development. It is an established fact that the BJP’s determination to do away with outdated and undesirable practices of triple talaq and polygamy and the steps the government at the Centre has already taken on this count resonate well with the female population and all right-thinking men among the Muslim community nationwide. The Muslim women and the right-thinking Muslim men of Karnataka would be no less enthusiastic about the introduction of a Uniform Civil Code in these matters. A guarded and appropriately orchestrated publicity campaign to enlist the support of the people coming under the ambit of the Muslim Personal Law would be in keeping with the BJP’s stance on the equal treatment of all the people, irrespective of their religion, caste or creed. The BJP would do well to keep track of the fact that whereas the government is Constitutionally bound to be fair and unbiased in its treatment of the people in all matters of state, wherever the party is in power either on its own or in coalition with the other members of the NDA, it still remains a Hindu national party. The mainstay of the party is the groundswell of support it receives from the Hindu community, which has squarely and unequivocally reposed its faith in the BJP in preference to the other parties. The party could, therefore, ill afford to press ahead with its efforts to win the support of the minority communities by any move or measure, which is perceived inimical to the interests of the Hindu community. The Congress government of Karnataka had been insensitive enough to commemorate Tipu Sultan’s Jayanthi last year in complete disregard of the sentiments of and protests by sections of the Hindu community who were descendants of the victims of the controversial ruler’s excesses. This was obviously a part of the Congress party’s age-old practice of appeasement of the minorities in keeping with its pseudo secularist policy. The BJP should take care to put an end to such uncalled for and unjustifiable practices and win over the trust of the majority community. A clear message has to be sent across to convey that the emotional wounds of people who have suffered historical blunders and injustices would not be allowed to be reopened and the underlying feelings of bitterness and hatred between different communities exacerbated. Then, cow slaughter is another emotive issue that has to be tactfully addressed during the campaign. It should also be made clear that a BJP government in the state would be governed by the party’s national policy in the matter; however, while doing so, the sentiments of Karnataka’s majority community would definitely be taken into account. The government would work for the progress and development of all the people with no appeasement gimmick to mar the government’s resolve to do justice to every community strictly in accordance with their legitimate interests and bonafide religious concerns. Growing incidents of violence and crimes against women, children and people from northeastern states are a matter of great concern in Bengaluru. A police force, free from political interference, with zero tolerance towards such crimes, is the need of the hour. Furthermore, the overall security of the state vis-a-vis the scourge of domestic and international terrorism has to be the top priority of the state government. Only a BJP government is capable of ensuring that the state’s interests are in alignment with the Central government’s stance on the matter. Another issue that the BJP election campaign should vigorously highlight is the rampant land grabbing cases that have plagued Bengaluru and other districts of Karnataka. A detailed report titled ‘Greed and Connivance’ prepared by V Balasubramanian, Chairman of the Task Force for Recovery of Public Land and its Protection, states that 12 lakh acres of government and public land have been encroached upon in the state by influential builders and land mafia with active involvement of persons in power, out of which 33,878 acres of land belongs to the Revenue Department in Bengaluru alone. The Bengaluru district administration has managed to dispose of only 13 land grabbing cases out of the total 6,000 cases that it has been dealing with for some years now. It is an open fact that land was illegally acquired even during past Congress-led governments of Karnataka through co-operative societies, and subsequent quashing of such land allotments by Hon’ble courts substantiates this. An anti-land grabbing special court set up in Bengaluru for speedy trial of cases pertaining to land encroachments, which became functional on August 31, 2016, has seen the registration of 348 land grabbing cases by March 31, 2017. Furthermore, an additional 243 suo motu cases were registered by the special court itself. In an order in April 2017, while quashing the acquisition of 189 acres of land for a cooperative society, the Karnataka High Court held that a middleman (now a minister in the Congress-led government) used his political influence and that ‘the land acquisition was opposed to public policy’. The BJP should assure the voters that if it wins the 2018 Assembly elections and comes to power, the state government will take up the disposal of all these pending land grabbing cases on priority basis and also initiate tough action against the land grabbers as soon as encroachment has been proved. The state voters should also be assured that stringent measures to curb organized attempts to grab lands belonging to the government, local authorities or other statutory or non-statutory bodies owned, controlled or managed by the government, will also be strictly implemented under the Karnataka Land Grabbing Prohibition Act. Although the coal and 2G spectrum scams, besides other illicit paybacks received by ministers of Congress-led governments in many states, made national headlines and have established that the Congress is the second name for corruption, it is the recent findings by the Centre for Media Studies that are illustrative of wide-ranging corruption in the state of Karnataka. It must not be shocking that the state, which is presently being led by ministers already under investigating agencies scanner, ranked at the top in corruption perception in the survey carried out by CMS. Along with Karnataka, all other Southern states have come out to be homes of corrupt government services; states like Bihar and Chhattisgarh, however, have shown improvements as compared to their past rankings. Good news for the BJP is that the same survey concluded that people could feel that corruption level went significantly down during and after the demonetization of higher currency notes; hence the public opinion is now tilted heavily toward the BJP. This is also a time when the Modi-led central government has completed three-years of ruling and it is a notable achievement that not even a single evidence-backed corruption charge has come up against any minister. The changes in the ministries were backed by performances and rationales and not by the obligation to remove any tainted minister. On the other hand, it is being felt that Muslim women are rethinking their stance and are now backing the pragmatic approach of the government in dealing with issues like Triple Talaq and Halala. The Congress-led Karnataka government could only appease the Muslim community by offering them sops; the BJP however is working for holistic development of the community and the same message must be spread by ground level workers of the party so that appeasement does not become a deciding factor in the upcoming state polls. Tepid police action against offenders from Muslim community, along with biased chargesheets to prevent convictions, has been a policy of the Congress government. The community, however, has realized that they can only grow by way of education and empowerment of women, not through government-backed impunity and pity sops. There are Naxals, Maoists and other such anti-national forces in the form of the Azaadi brigade among the students, academia, multimedia, religious institutions and political parties, which are inimical to the interests of nationalism and territorial integrity of our country. They are out to destroy the very concept of India that is Bharat. Today, the BJP is the only national party that is capable of unifying all the patriotic elements around the pivotal force of devotion to the task of nation building. The corrupt form of secularism currently rampant in the body politic has to be replaced with a strong sense of pride for the country, its flag, national anthem and other icons and legends that constitute the strands of patriotism. Bharatiya Janata Party’s campaign for Karnataka has to be imbued with this message for striking an empathic chord to the cause of clean governance and the cause of nationalism. The BJP should not shy away from propounding its case, which is in the best interests of the nation as well as the party and, needless to say, the people and the state of Karnataka. 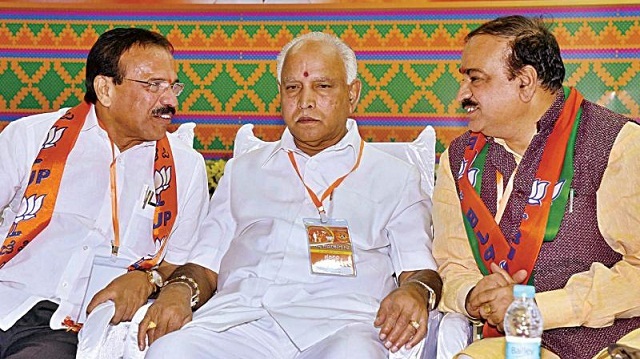 The party owes to itself the clinching of the campaign for Karnataka, which could become its gateway to greater victories in the remaining southern states. The 2014 General Election was revolution in post independence India by voting non Congress single party with majority. Partly Congress mukt Bharat agenda is met but disturbingly many promises are unfulfilled and nothing happening concretely on economical front. Just to divert attention from burning issues of employment, GDP falling, threat from our own neighbor (China, Pakistan) our strategic relationship with Nepal (only Hindu Himalayan Nation) law & order situation with PDP-BJP coalition govt.and host of issues are taken away by debate on non issues like Love Jehad, Cow Slaughter, Not Bandhi and so on. I think high time that before 2019 general election very drastic action that will raise hope pre 2104 is call of day otherwise, BJP- Narendra Modi will be another power hungry and full of promises party. With US headed by unpredictable President, Russia is yet to heal wounds post 1991 break-up, China unstoppable Super power, disintegration of Europe, GCC and entire Arab World with suspicious and religious and terrorists group taking law and order and destabilizing political and economical activities, African nation in absence of strong regional leadership how Indian leadership is going to take position of external affairs when there is definite lack of trust within Indian politics and lack on consensus. We definitely need strong leader and strong party but which can take everybody and tolerance for democratic values and ethos. Hope there is no substitute for experience and our political veterans too will catch up with time.